Traficant got a rousing reception Sunday night. (CNN) - Former Rep. James Traficant had a triumphant homecoming Sunday night, his first public appearance since being released from federal prison, a local paper reports. The Youngstown Vindicator said Monday a supporter-organized welcome home dinner for the former Democratic congressman, which drew the capacity crowd of roughly 1,200 Sunday, included performances by an Elvis impersonator and a polka band, as well as a speech from Traficant himself. The newspaper reported that Traficant was defiant, telling listeners that he'd "been hounded by some government people for a long time" and that the government "had to cheat to convict me." "'If you want to know the true nature of a country, you must go through its prisons,'" said Traficant, quoting former South African leader Nelson Mandela, who spent nearly three decades in prison. "I know America. I've seen the other side of it, and I don't like it." 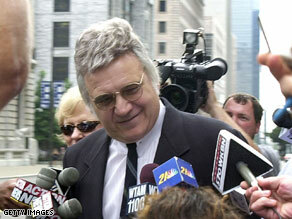 Traficant was released Wednesday after serving just over seven years in federal custody for charges that included racketeering, obstruction of justice, tax evasion and bribery. The Vindicator reported that Columbiana County Republican Chairman David Johnson, who tried to defeat Traficant for years, was on hand for the event, and said the former congressman would have his support if he mounted another bid for office. "I would support (Traficant) tomorrow if he ran for Congress," Johnson told the paper. Was his hair like that before prison? So, why didn't CNN ask the County Republican Chairman WHY he would vote for Trafficant. Yes, pols walk a fine line between legal and illegal every day. If you weren't there (and 99,9% of you weren't), then you have no idea what happened. I'm not saying he's innocent. But look how many innocents get convicted...especially in Texas. So, don't judge others, lest you be judged. Let us be a forgiving nation-he has served his term and need forgiveness from the public.